Seventeenth-century vellum binding over card boards; printed missal fragment of sixteenth or seventeenth century used for spine. 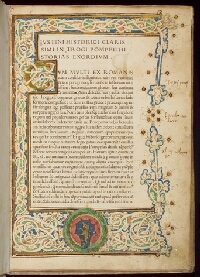 108 leaves; wanting the title page; on the first page is an illuminated initial and border decorations, with coat of arms within lower border; other initials in red and blue with guide letters; unfoliated and unsigned; some contemporary marginalia in italic. 1. Markree Library (book label). 2.Isseido/一誠堂書店 (booklabel).